A couple of years ago, while looking for a full length play, I stumbled across these very short plays and fell in love with them. But what do you do with a 20 minute play? They were put aside, but never forgotten. Turns out that when you start a theatre company, you can do whatever play you wish! Why not a one hour show with three short plays? Although they are written by different playwrights and are not connected, they seem to run so well together, showing us relationships from beginning, middle and end. From how two people meet, to another couple dealing with the seven-year-itch to our final couple being in it for the long haul. These stories we present to you are not out of the ordinary. They are things that happen to all of us, but in a humorous way. Two people, in the waiting room of their psychiatrist’s office, speak for the first time in 18 months. They discover that they have both thought of the other. Despite their neurotic tendencies, they get to know each other and build a fantasy life. But is it too late or will they work though their barriers? With her boyfriend on one phone line and her lover on the other, how will this girlfriend juggle the two and get everything she thinks she wants? And when the boyfriend throws a wrench into her plans for that night she needs to think quickly! A one night stand becomes a lifetime of love, sarcasm and therapy. 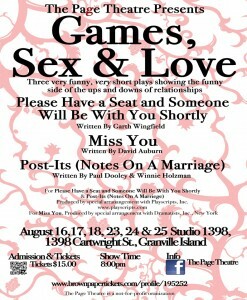 This couple take you on a journey spanning 50 years through the ups and downs of marriage and family. And all via post-it notes!